The HeartSine samaritan PAD 360P (SAM 360P) analyses the heart rhythm and delivers an electrical shock to a victim of Sudden Cardiac Arrest in order to restore the heart to normal rhythm. This user-friendly AED provides easy to follow visual and audio prompts, including CPR coaching which verbally guides the rescuer through the CPR process. Shock delivery, if required, is fully automatic which means there is no shock button to press. The SAM 360P utilizes clinically-advanced samaritan PAD technology, including proprietary electrode technology, advanced and stable firmware, and proprietary SCOPE™ (Self-Compensating Output Pulse Envelope) biphasic technology (an escalating and low-energy waveform that automatically adjusts for patient impedance differences) to assess rhythm and maximize effective shock delivery if necessary. With a rating of IP56, the samaritan PADs are the most robust AEDs available on the market, providing the highest level of moisture and dust ingress protection in the industry. This makes the HeartSine AEDs equally ideal for use in the corporate office or in the field where exposure to the elements is a challenge. All HeartSine samaritan PAD models use the company’s innovative Pad-Pak™ cartridge that houses both the battery and electrodes for the device. One expiration date eliminates the need and reduces the costs to track and inventory two separate items, giving the samaritan PAD one of the lowest costs of ownership in the industry. And the Pad-Pak features a rapid replacement mechanism that enables both the pads and the battery, which is also available with EASA’s latest ETSO-C142a certification, to be replaced within seconds. The SAM 360P will complement the SAM 350P by providing users with a choice of either a fully-automatic device or a semi-automatic device. Along with the SAM 360P, HeartSine will offer a new samaritan PAD Trainer TRN-360 that simplifies CPR and AED training. The new samaritan PAD Trainer guides users through simulated analysis, energy delivery and prompted Cardio Pulmonary Resuscitation (CPR) intervals with the look and feel of a live samaritan PAD 360P without the actual charge and discharge of an electrical shock. 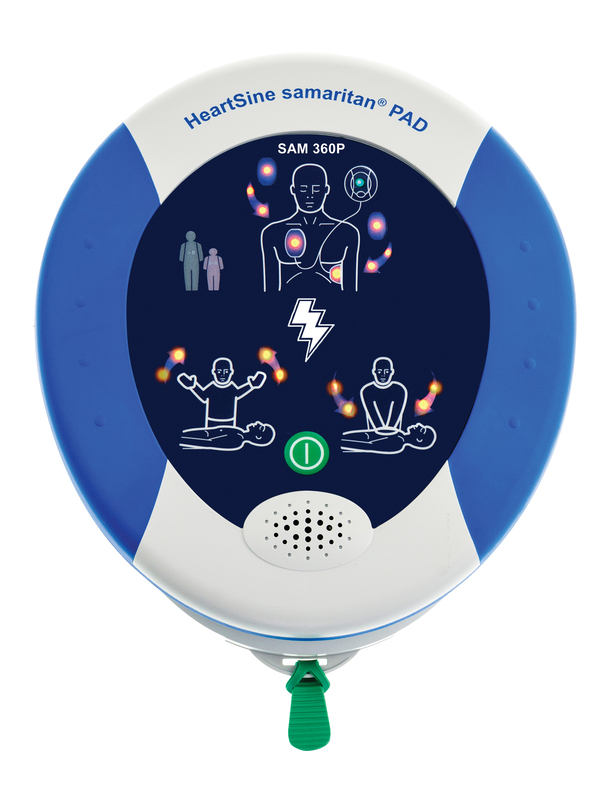 The samaritan PAD 360P is immediately available in several countries in Europe, Asia, Africa and Latin America, and will roll out to additional countries as local regulatory approvals are received. The cost of the device will be comparable to that of the SAM 350P.